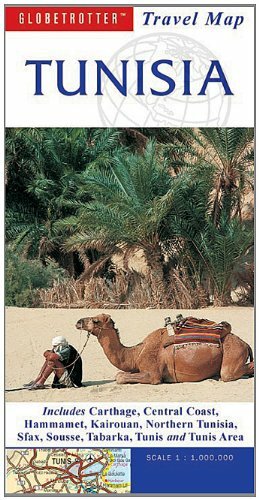 Following on from my previous post, I spent the morning of October 21, 2000 exploring the Tunisian island of D'Jerba. Shortly before noon, I hopped the ferry back to the mainland and drove south to the town of Medenine. Medenine, or "Medinine" (depending on which map you happen to be looking at), is an easy 46 km drive southwest from Jorf. It is the capital of Medenine Governorate of Tunisia (similar to the way Salem is the State Capitol of Oregon in the U.S.). It was also the location of Rommel's last African campaign in WWII before he was replaced by General Hans-Jürgen von Arnim. But I was stopping for another reason. 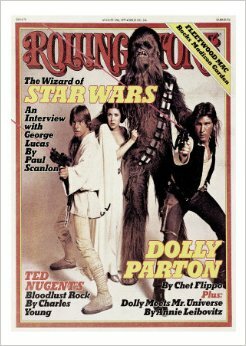 It was years later, 1989 or 90 to be more precise, that I found that issue in my college library. That particular passage stuck with me and I was reminded of it when images started to trickle out in late 1997 from the forthcoming STAR WARS prequel. Shortly after the film was released in 1999, I found out that one of locations was the ksar of Medenine. 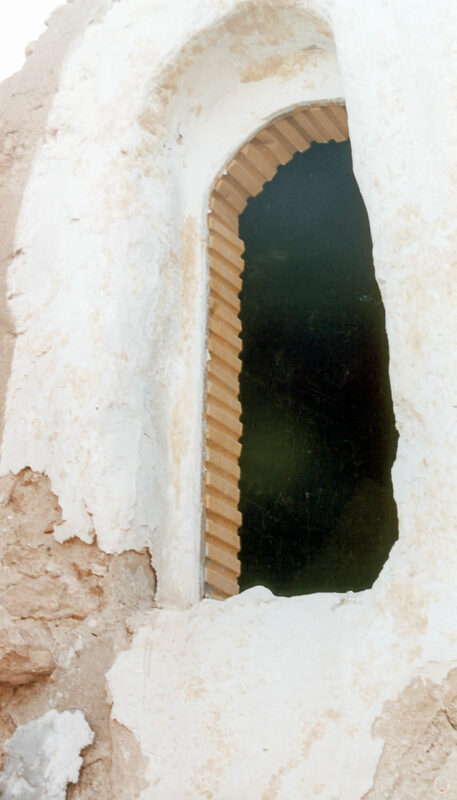 In the years before, I had learned of ksour (the plural of ksar) and knew that they were fortified Berber granaries comprised of individual chambers or ghorfas. I also learned that they are considered to be a probable influence of Louis Kahn in his design for the Kimball Art Museum. In those pre-google Earth days, I wasn't quite sure what to expect or how easy/difficult it would be to find the ksar. However, as I drove into town, I found it fairly easily and quickly near the town center. 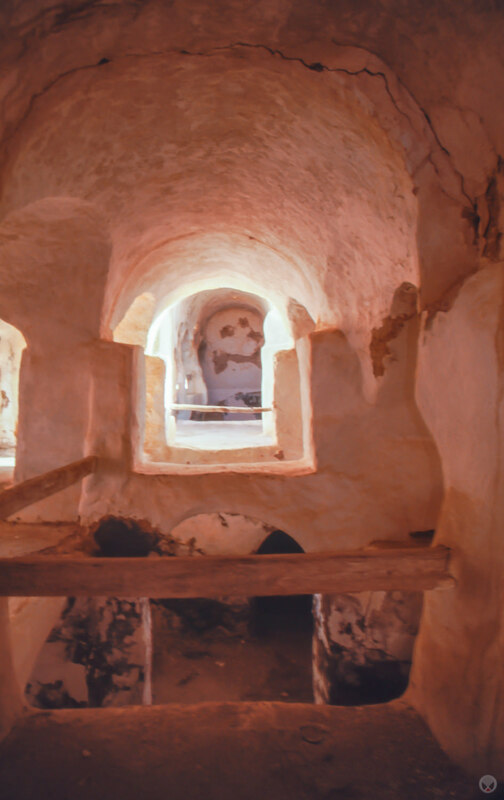 While most of the doors, ribbing, and other assorted set dressing had been removed, the actual barrel-vaulted ghorfas were very much as they appeared in the film. As I mentioned, getting to Medenine was very easy. I simply drove the 46 km from Jorf on C108. Once in town, I remained on C108. Near the center of town C108 connects with a roundabout and continues on to P1. The ksar is located on the right side of C108 two blocks before you reach the roundabout. Here is the wikimapia link. 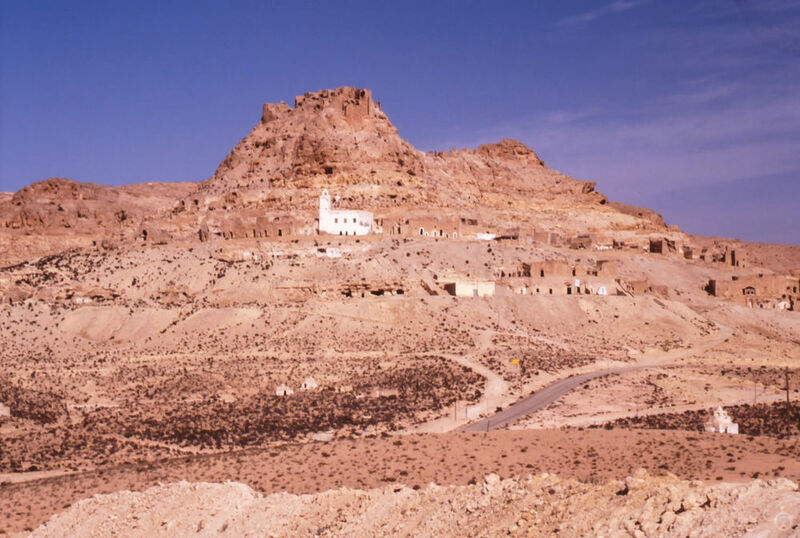 After exploring the Medenine ksar, I drove west up into the hills to visit another ksar I'd read about. 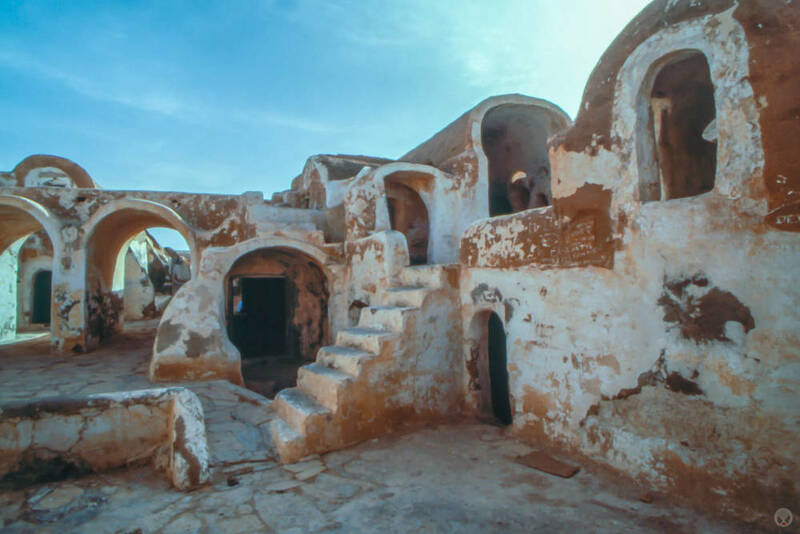 Ksar Hadada (or Ksar Hedada) was also used for Anakin's home. 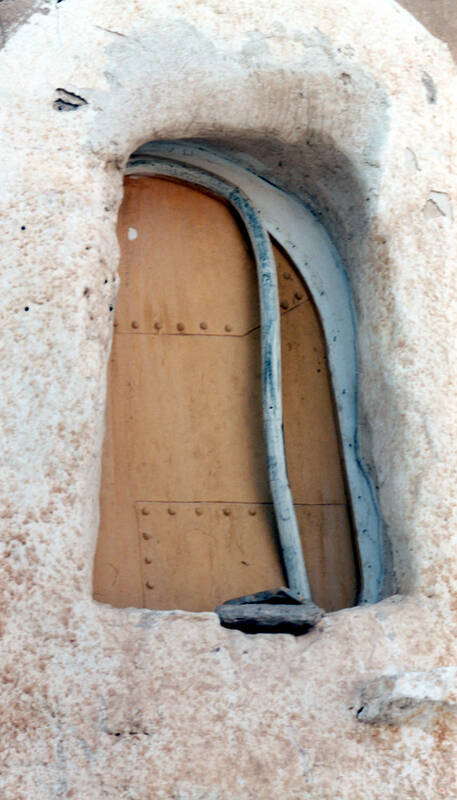 While the Medenine ksar served as the front exterior, Ksar Hadada served as the back. Actually, it is one of two locations that were used for this purpose as a small part of it was recreated by the film crew over 100 miles away on the edge of the Chott El Gharsa. But I'll get to that in a later entry. 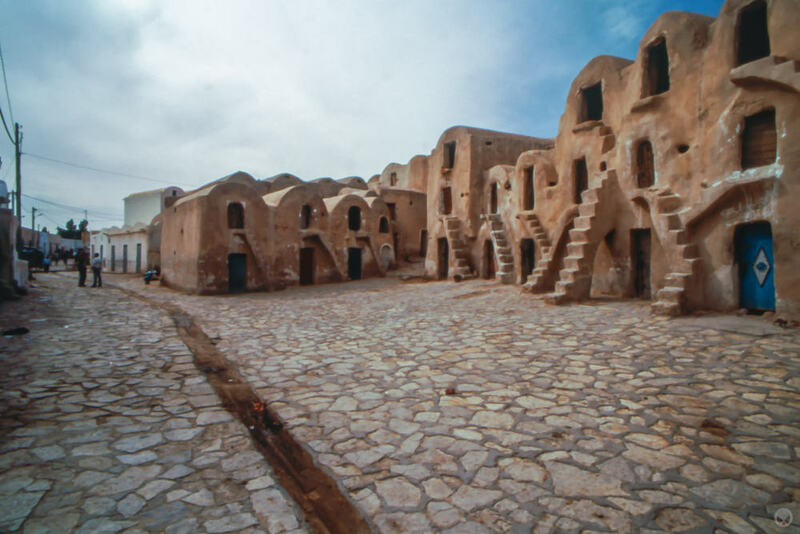 Prior to filming, the ksar was used as a hotel. It may have operated in this capacity for a time after filming as well, but by the time of my visit it was no longer functioning in this capacity. This was one of the locations that I had GPS coordinates for. Since I wasn't quite sure where I was headed, I used my GPS ... and immediately got lost! Well, not really. It led me off road less than a kilometer from the center of town. I soon realized this, got back on the road, and found the ksar right in the center of the small town. A few months prior to my trip, the US government had declassified some of their satellites - making them some ten times more accurate for common folk such as myself. I suspect this was to blame for the error in my route. 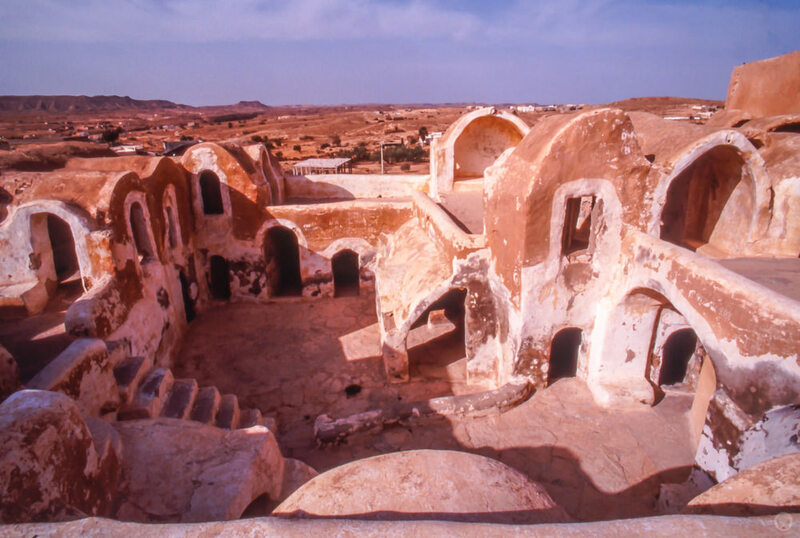 As you might guess, you don't need GPS coordinates to find Ksar Hadada. From Medenine, there are two main routes. You can head west on C113 until it ends. At this point, turn left and head south on C207 until you reach Ksar Hadada. The ksar will be on your left near the center of town. Alternately, you can do as I did and head southwest from Medenine on P19. When you reach C121, make a right turn and take it to the town of Ghomrassen. At the central roundabout in Ghomrassen, turn off P19 and onto C207. 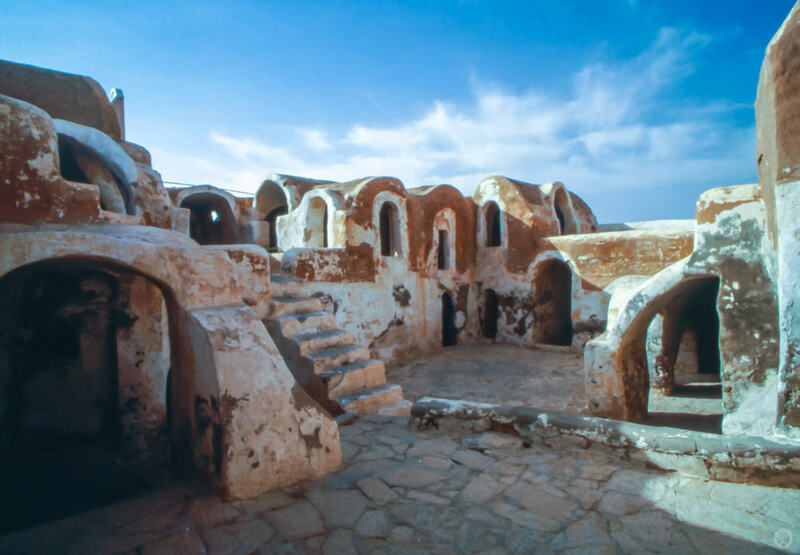 Take this north a few miles to Ksar Hadada. Don't go off road as I did. Instead, take the first right when you enter the town. On this route, the ksar will be on your right after a few blocks. Here's the wikimapia link. 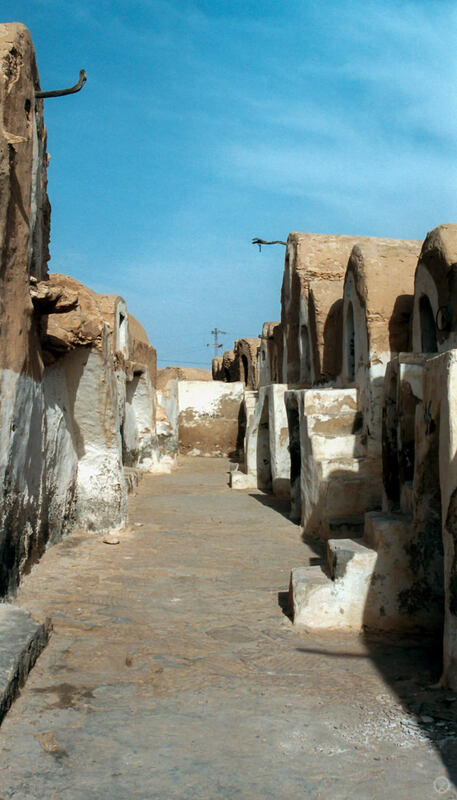 Like Medenine, Tataouine (or Foum Tataouine) is the capitol of its same-named Governorate. It's known for dinosaur fossils, a meteorite impact, and numerous ksour. 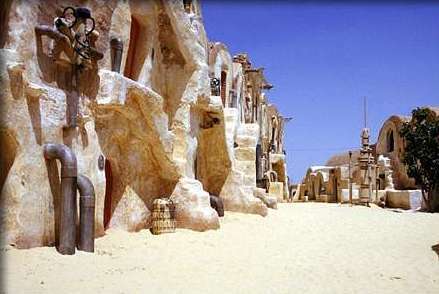 It is also known as the inspiration for the name of the Skywalker home planet of Tatooine. 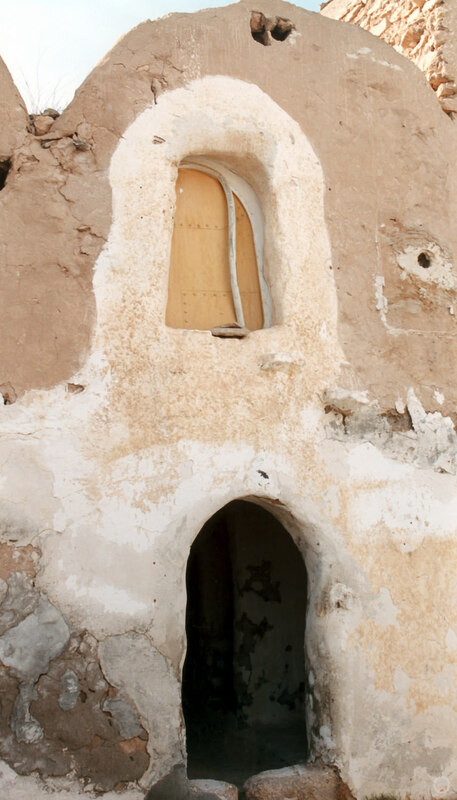 After visiting Ksar Hadada, I stopped at Tataouine for the night. Within minutes of booking a room, I was back out on the street in search of a bite to eat. My previous days in Tunisia had taught me (almost instantly) that my blond hair and fair skin would cause me to stand out among the darker skinned/haired Arab and Berber natives. I suspected that if Tataouine locals were anything like those in the other parts of Tunisia that I had experienced so far, they would be among the most outgoing and friendly people I've ever encountered. It was true. Within just a few minutes I was sitting among a group locals enjoying pastries and mint tea. It didn't hurt that I had my binder of movie stills with me and they took great delight in looking through them. Not long after that, one of them took me to his house for dinner. It turned out that he worked for the local tourism office and for a few Dinars he offered to have a friend of his guide me to some of the local ksour the following day as he himself had a prior commitment. The next day his friend met me at my hotel and together we set off to visit the ksour. We stopped at two or three small ones that were still in use as functioning storage units, before we came to one called Ksar Ouled Soltane. I had heard rumors that Soltane had been used as an Episode I filming location, but to this day, I haven't read or heard anything that officially confirms or denies this. During my visit to this fully restored ksar, I looked for evidence of filming in the form of set dressing, but found nothing. I suspect that it was probably scouted, but that any filming was likely limited to reference plates for use by ILM in post-production. Never-the-less, it was a cool place to visit. 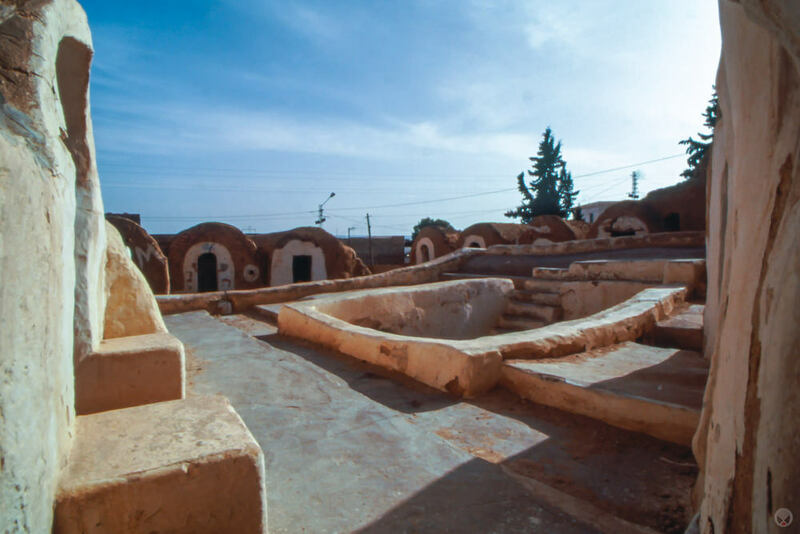 After Soltane, we made a brief stop at the large Ksar Ouled Debbab, south of Tatahouine, before heading west to visit several hilltop Berber villages. The first of these was Douirat where my guide took me up, into, and ultimately on top of the mosque for a nice view of the surrounding landscape. After Douiret, we ventured on to Chenini, where I found my host from the previous night waiting to show me around. After Chenini, I returned my guide and several European tourists to Tatahouine. I then stopped at the post office to mail a few postcards (with the Tatahouine postmark) before heading back into the hills toward the troglodyte village of Matmata. That would prove to be the most difficult road of my Tunisian journey so far. As I remember it, I retraced the drive to Ksar Hadada and somewhere north of that town I elected to take what I thought would be a short cut. It looked shorter on the map anyway. Perhaps it was, but had me driving on a non-paved road through small, unnamed settlements, and even a military outpost (!) before eventually reaching Matmata several very dusty hours later.